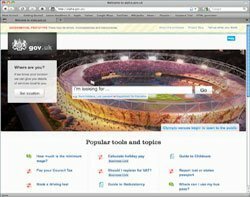 Alpha.gov.uk - the pilot website that could eventually put all government websites on one URL - has received about 1,000 comments from members of the public, since an early version of it was made available for comment. Alpha.gov.uk, is half way through its two-month public consultation period. It is being developed using agile software development techniques, crowdsourcing and cloud computing. Tom Loosemore, deputy director of the Cabinet Office's Single Government Website development team, said there has been about 600 comments made on the website in public with a few hundred by e-mail: "We want the comments on the website to be made in public but obviously certain people such as civil servants prefer to do it by e-mail. "We were set the challenge of shifting all government websites to a single domain while being user-sensitive. The best way to do this is to build a very early prototype and get real feedback from real people," Tom Loosemore told Computer weekly last month. There have been frequent questions about the technology underpinning the website - which is open source, in keeping with Cabinet Office strategy for public sector software - as well as suggestions for improvements and criticisms. Alpha.gov.uk was triggered after digital champion Martha Lane Fox gave the government her report on its digital services. She recommended all government digital services should be under a single URL. "The user should not have to navigate the departmental structure of government before finding the service or content they need. On the web, this implies the adoption of a single internet domain for central government," Martha Lane Fox reported.